Not all wetsuits are triathlon specific made for swimming on the surface of the water. Dive or water sports suits are designed for protection from the elements, they do not provide much buoyancy. It is the buoyancy or lift on the water that helps you conserve energy while riding high on the surface. 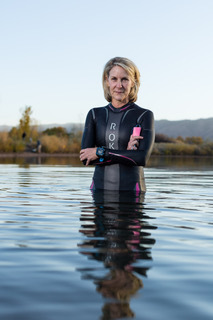 Tri wetsuits come in different styles: sleeveless and long sleeves are the most common. You will be more hydrodynamic in the wetsuit as drag forces are reduced enabling you to swim faster. They do provide warmth and protection from cold waters, but they’re designed more for performance than protection. Neoprene makes the wetsuits naturally warm. Tri wetsuits are more flexible to allow both range of motion and speed of movement most importantly at the shoulders. For those new to wetsuit swimming, some water will always get inside the suit. This is normal and why it’s called a wetsuit (vs a dry suit for super cold temps). Your body will warm the small amount that gets between your skin and the suit. Water is a perfect conductor of heat from the body. This is why water is so wonderful when we are overheated. Air and water temps are not equivalent. A 65 degree day is quite comfortable, but 65-degree water temperature is very cold. Most pool temps are between 78 and 82 degrees. We can swim comfortably in temperatures from the mid-70’s and above. Temps in the 60’s are uncomfortable and may not be tolerated for long bouts in the water without a wetsuit. The 50’s and below are dangerous without proper protection from a wetsuit. Every body is a little different in what they can tolerate. All bodies can be trained to adapt to the cold. This is key to swimming faster and more comfortably in a wetsuit! It needs to be snug, fitting like a glove, but not too tight as this can cause a sense of panic and claustrophobia from the restriction to breathing. Too loose means dragging gallons of water along with you resulting in a much higher effort level and slower times. The main areas to check for fit are crotch and shoulder areas. You will need space in your torso to swim without restriction. Shoulder areas should provide the ability to reach fully and rotate allowing full range for the arm pull and recovery. The wetsuit needs to support your swim stroke, not restrict it. A note on comfort: a high-performance wetsuit may not feel comfortable as it is designed for speed. A lower end model may fit a little looser and feel more comfortable. Be careful not to go too lose as this can cause chafing. A suit may become looser over time and you want to avoid carrying too much water with you around the course. Sleeved or sleeveless? A sleeveless wetsuit is best for warmer water temps and for those who feel too much restriction in the shoulders with a sleeved suit. Colder temperatures make a full sleeved suit much more comfortable. New technology and thinner neoprene makes the long-sleeved suits very flexible providing no restriction to arm turnover. Do train with the wetsuit to get used to the extra effort wearing neoprene on your arms and shoulders creates to push your arm through the water repeatedly. Full-sleeved suits are the most popular and provide the best option for swimming faster as they are more buoyant and create less drag. Sleeveless suits let in more water. 4. Pricing: Are the more expensive suits worth the higher cost? Not all wetsuits are created equal. The reality is that mid to high price range suits have more benefits and features to help you swim better and faster. Higher quality rubber and a range of thicknesses throughout the body are main features in higher priced suits. Buoyancy comes from a combination of thickness and type of rubber. USAT, ITU and WTC (Ironman) have rules restricting the thickness of the wetsuit to no more than 5mm. Most brands will put the thickest rubber on the front torso and legs to give the heaviest areas of your body the most support and lift making it easier to swim. Thinner rubber (1.5-2mm) at the shoulders allows for greater flexibility and arm speed. If you’re just getting started in the sport, watching your budget or just want a suit to get you through training and racing, you don’t need to spend a lot of money. Lower priced suits will fulfill the basic requirements needed to help you with your swim and protect you from cold temperatures. If you come from a competitive swim background or are looking for improved performance, a mid-price range suit will work best. You can enhance your speed and comfort in the water without breaking the bank. High-end wetsuits feature the newest technology, high-quality buoyant rubber and offer a high degree of efficiency, flexibility, buoyancy and performance. At the highest end, there are suits that feature every new innovation and the latest technology to help those looking for every edge they can find to improve performance. One option when you don’t own a wetsuit is to rent one. You can rent them easily and at a much lower cost than buying one. This is also a good way to test out a wetsuit before buying one. The only down side is that it is not yours and you need to plan ahead for when you want to use one for both training and racing. On big race weekends, shops can sell out. Wetsuits are available to rent at your local tri, bike, run or swimming shop. Online retailers offer rental options throughout the country. Wetsuit companies or retail stores will often offer a test day at your local open water venue throughout the summer. You can test out different brands, styles, and sizes to determine which suits you and your budget best.